United signed an agreement with sportswear manufacturers Olympic Sports in the summer of 1998, and with an extension to the Telewest shirt sponsorship, their third season with United, both deals together were worth around £1 million to the Club. OS were already manufacturing kits for Hearts, as well as several lower League clubs in England, and their designs were quite distinctive but also typical of the flamboyant styles of the 1990s. United’s kit for the 1998/99 campaign was OS’s standard design for that season, with the same look as what Southend United, Scarborough and Rushden & Diamonds all had. The tangerine shirt had black flashes on the left shoulder, and the bottom left of the shirt had a mixture of a black and grey jagged pattern and a black and white swoosh, that took up about a quarter of the top. There was also the same pattern on the reverse of the shirt, appearing at the back left. The collar was a combination of an overlapping V-neck with a turnover collar, black in colour with a thick tangerine stripe with white trim. The Telewest logo changed for a third time in as many years, with the text now a single black word with a white outline, and the green sphere being more obvious. Instead of the regular fashion of having the logo attached to the shirt, the logo was now printed into the material. The black shorts continued the black, white, tangerine and grey pattern style from the shirt, this time in the bottom left corner. The socks were tangerine with black trim and a black band in the middle of the shin. With the emergence of the SPL in the summer of 1998 after the top teams broke away from the Scottish League, the 1998/99 season saw the beginning of players names and squad numbers being placed on the back of the shirt. 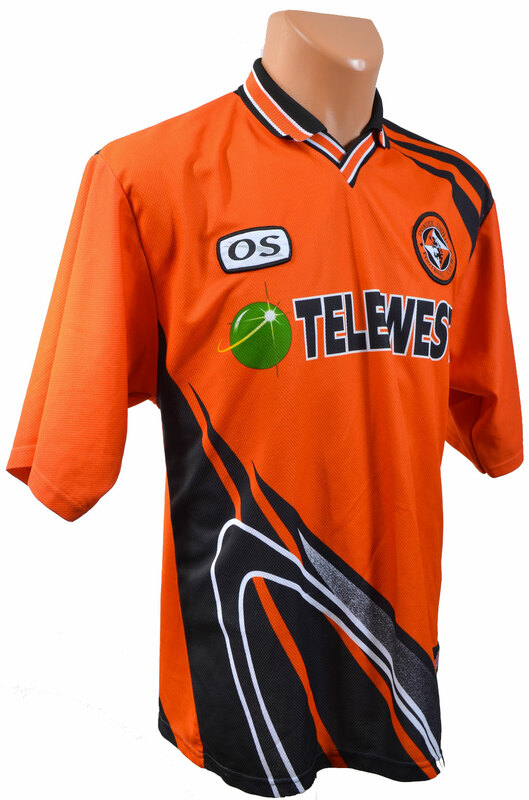 The first competitive game in which the OS strip made its debut was the 0-2 defeat to Kilmarnock at Rugby Park in the opening match of the season. After just six games, including three League defeats and a shock exit at the hands of Second Division Ross County in the League Cup, Tommy McLean resigned and was replaced with Club legend Paul Sturrock. The new manager brought in ex-Dundee and St Johnstone striker Billy Dodds from Aberdeen, whose performances were some of the few brighter moments of a poor season, as United finished second bottom of the first SPL season, 6 points above relegated Dunfermline.